What makes a woman a lady? Detail, girls, detail. And being memorable. And what's one of the most effective ways to be memorable? To have a signature scent. Other women may be gifted with other assets, but when it comes to animal instincts, scent is the strongest trigger – we're all animals after all, even ladies. Having a signature scent is an even more effective a weapon in your cache of feminine charms these days, as there aren't many people who have their perfume made specially. Some of us pay more than others but, sadly girls, most of us smell off the shelf – though in many cases we're a mixture of off the shelf products that as least sets us a little apart from each other. But imagine the power your could wield over those around you if you had your very own smell, one that lingered after you and made people miss you, or one that you could spray on letters to prompt people regarding their relationship with the author? Now that you're done imagining it here's how to make it a reality: attend a signature scent workshop at Homemade London, simple as that. 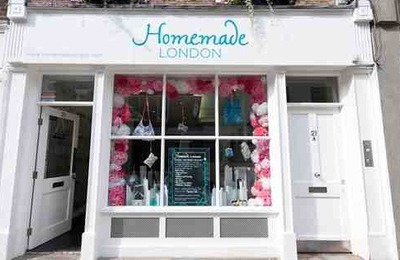 Homemade London is a Mecca of arts and crafts for the busy Londoner who likes to 'do' for themselves, and their 'Make your own Scent' course is one of their most frequent offerings, hosted in their gorgeously decorated Marble Arch adjacent space, by 'Perfume Mistress', Tanya Moulding. An aromatherapist by trade, Ms. Moulding will take you though the parfum basics: from understanding the concept of a smell having top, middle and base notes, to a scientific deconstruction of your fave. scents that will help you emulate them or include them in your own fragrance. In case you're wondering, base notes are the sorts of scents that last the longest, middle notes are the ones that show though after a scent has warmed on your skin, and the top notes are what you get in the initial puff as you spray perfume onto yourself. Part of the secret to creating your own scent is knowing what smell groups there are so that you know what you can borrow from and blend: from the most floral of the flowers: rose otto, to the spiciest cardamon, and the sweetest, vanilla smelling benzoin. There are a basic 20 oils to work with during the workshop, all of them natural and organic, and the make-your-own process is as simple as dripping drops of perfume oil into a beaker, sniffing, and then dripping other drops in and sniffing again. With the help and supervision of the Perfume Mistress of course. The real secret is knowing how to mix perfume oils so that they work together and don't overpower each other, which is another thing Ms. Moulding will teach you. Some scents work well with others even if you don't like the smell of them on their own. Part of the experience is learning what you like and being fascinated by what other people like. By the end of the evening you'll have used them to create two bespoke perfumes just for yourself, one for evening wear and a, generally, lighter one for office hours. Everyone also leaves the event full of supper/ snacks, bubbly wine and/ or tea or coffee. And with the recipe for their own perfume in case you love it so much you want to make it your signature forever. The course is three hours and £99 – which is worth it considering how priceless your new scent will be.